Ever wondered how self-binding receiving blankets are made? They can be a bit confusing – until you’ve made one! It’s a lot simpler than you may think, and you’ll have one (or two!) made in no time. 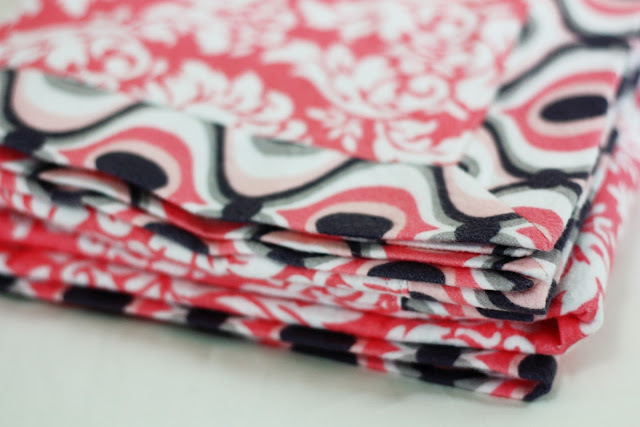 Read on to learn how to make a receiving blanket my favorite way! 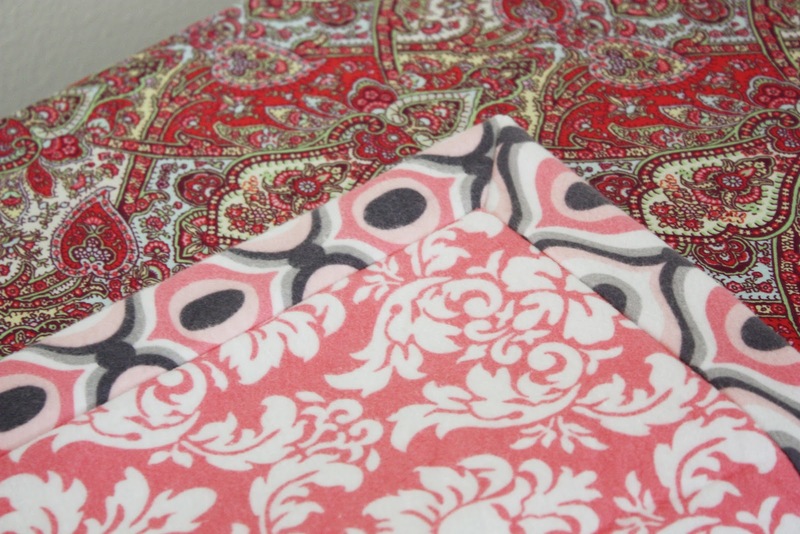 Pair a cute blanket with some burp cloths, and you have the perfect baby gift! Ready to get started? ruler – I use a mat and ruler set similar to this one and couldn’t live without it! Note: The sizes you cut your blanket top and back will determine your finished blanket size. In this case, pieces cut at 42″ and 36″ will give a finished size of 39″. 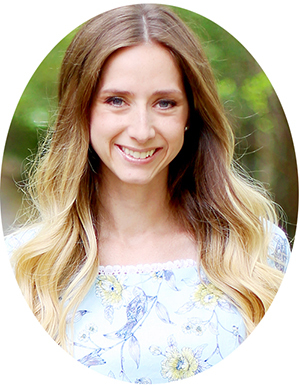 If you want to adjust your size, just remember that the finished size will be the median between the two sizes you cut (39″ is 3″ larger than 36″ and 3″ smaller than 42″). Also, the larger the difference between your the size of your two pieces, the larger the border will be. 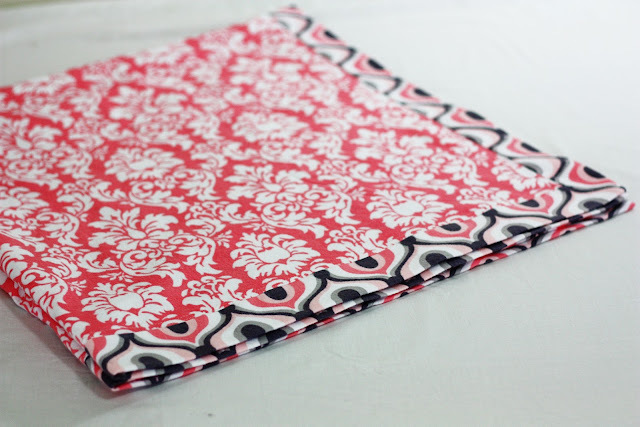 With the measurements in this tutorial, the border will be 1.5″. 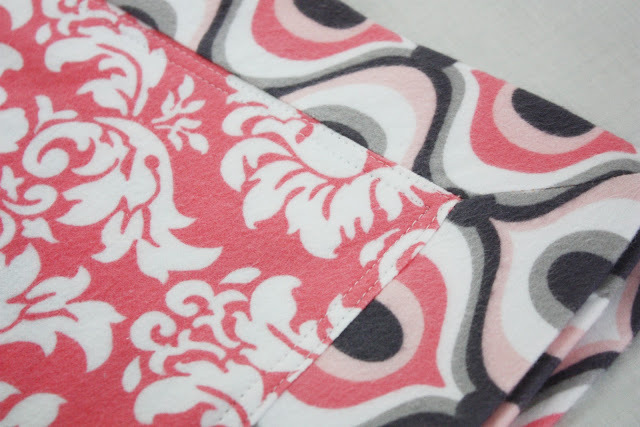 If you want a larger border, you can increase the amount of difference between the two flannel pieces that are cut, and of course the opposite is true for a smaller border as well. One thing to keep in mind with a larger border is that the larger it gets, the smaller your finished size will be as well, which is one reason that I like to keep a 6″ or less difference between the two sizes. 1. 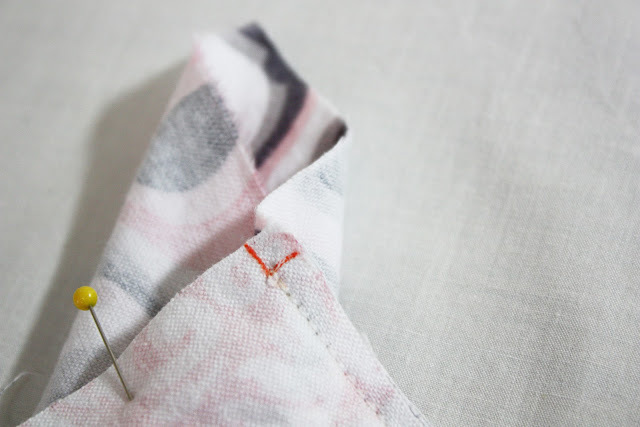 Fold each flannel piece in quarters and mark center of each edge with a pin. Open pieces up and pin, right sides together, starting at centers and working outwards. Each end will be left with excess backing fabric. 2. Mark 1/4″ in both directions by drawing a small square on each corner. 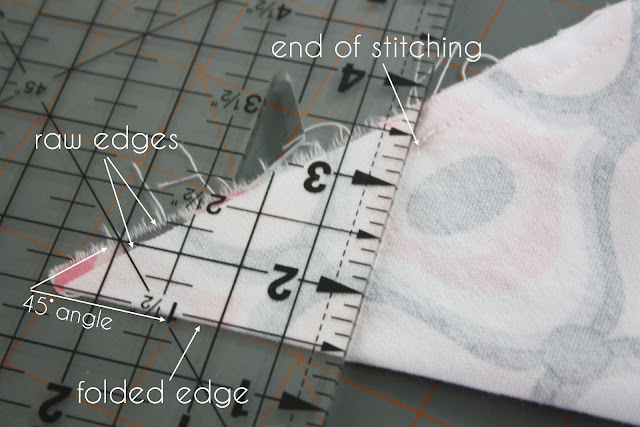 Using these marks as your stopping and starting points, stitch along each side of pinned pieces using a 1/4″ seam allowance. 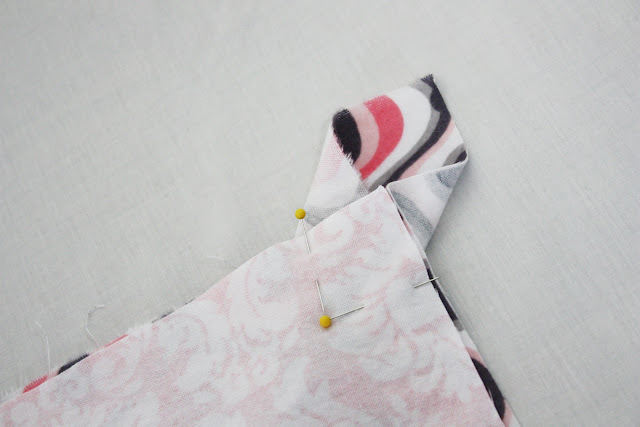 If you’d like, you can start stitching at center of each side and work outward rather than stitching from end to end, but if you’ve pinned well you shouldn’t need to. 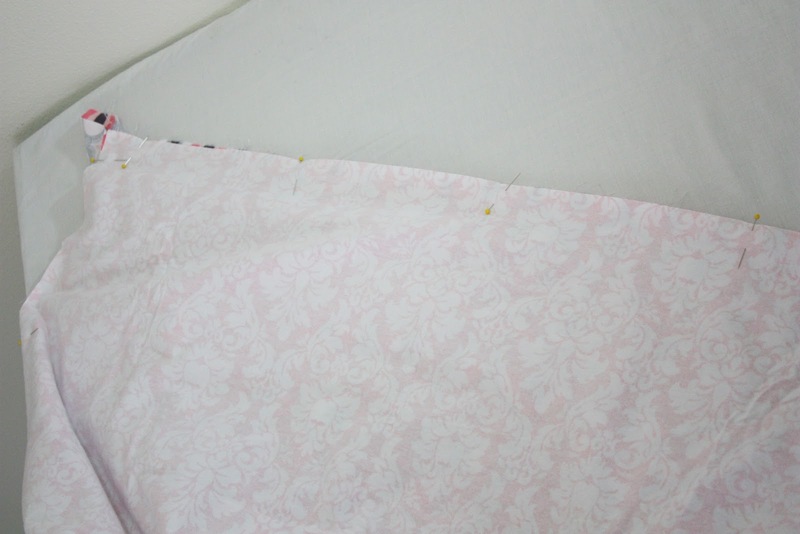 Leave a 6″ opening on the middle of one side to later turn the quilt right side out through. 3. Matching adjacent seams, fold one corner of the blanket as pictured. The excess backing fabric should form a 45 degree angle, and raw edges should match up, with the blanket front fabric tucked inside. 4. The next step can be tricky to visualize, so just make sure to follow the illustrations and you’ll be fine! 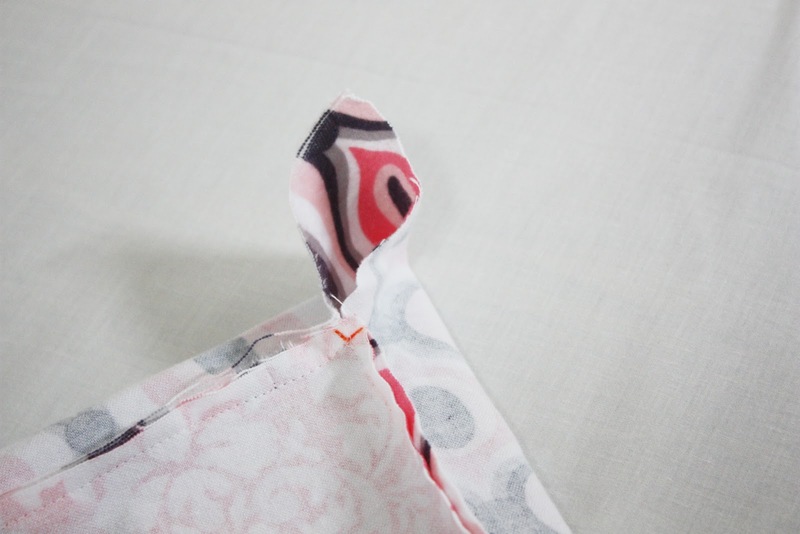 Align your ruler with the end of side seam stitching, forming a 90 degree angle with the folded edge. 5. Trace along ruler edge, marking 90 degrees from the folded edge to the end of stitching. Stitch along marked line from folded edge to end of side seam stitching. 6. Trim seam allowance to 1/4″, removing excess backing fabric. 7. Press all seams and turn blanket right side out through opening. 8. Carefully press mitered corners in place. 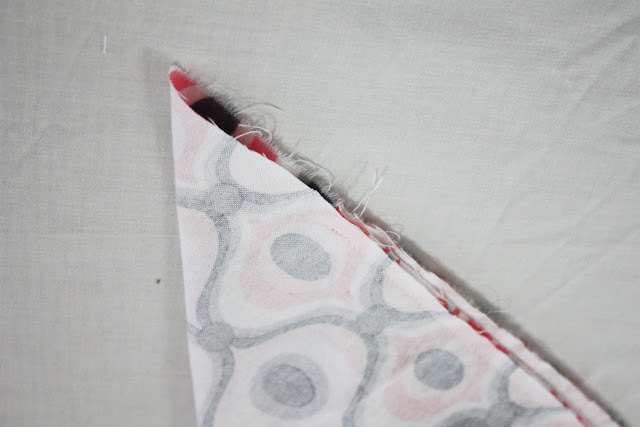 Press all four borders flat, being careful that they are evenly sized on all sides (it can help to put a couple of pins away from where your iron will be hitting to make sure everything will lay nice and flat). 9. Topstitch close to seams on all four sides of blanket, and stitching closing opening. Add a second row of topstitching if you prefer. Great job! Now that you’ve learned how to make a receiving blanket, admire your blanket and make some more! Can’t wait to try this and make a bunch for my future niece!!! Yay! I’ve been waiting for this post ever since you introduced the idea last month. I’ve never made one before because the other tutorials I’ve seen were difficult to follow. You did a great job of describing and taking selective photos to illustrate the steps. This is the best tutorial on this subject that I’ve seen!! This is an excellent tutorial for these blankets! And I appreciate the added info on changing up the border size. What fabric is this? I love it! SPLENDID tutorial! I have recently seen an online video of this same concept, but this tutorial makes the process so much more plain. And I can easily refer back to any step if I need to refresh my memory. The info on customizing the border size is extra-helpful, too. I’ve always struggled with getting my borders to look nice. Now they’ll be simple and look great. Abby, you ROCK! Thank you so much for this easy to follow tutorial! I watched the u-tube and she said to turn in inside out before cutting the corners! I was very glad I did because I didn’t realize that I had the angle wrong until I turned it! Your picture of the angle and the raw edge and fold was very clear and I just didn’t pay attention. Thanks for the precise instructions. I ended up hand stitching the opening closed and then top stitching. I just can’t wait for the flannel possibilities with this method! Thank you. My Triplet grandaughters will be cozy in these double flannel blankets!! Can you explain to me how you fixed this mistake? This has come at the perfect time. I have just been going through my stash for suitable fabrics to make a baby blanket . Now I know what to do with them. Thanks! Thank-you so very much for this tutorial. I have been trying to figure this out by myself and your instructions make some of the fine points very clear. Will be making several of these soon. You make it look so easy …. thank you, thank you! What a great tip! I’ve never seen this before and could have used it several times now. Looks so neat! Thanks for sharing. This is totally awesome, Abby! Next baby blanket will be bound this way. absolutely amazing!! I hate binding more than anything because of the corners but this looks so simple and is gorgeous! Thank you for taking the time to do the tutorial!!! Great tutorial! Love how sharp those corners look and can’t wait to make a few of these! Thanks for this great tute! I’m having a problem with the final product though. There seems to be too much material in the middle, nothing will lay down flat. I have what amounts to a giant floor pillow, if I were to stuff it. I tried making it in a smaller size to see if I could figure out the problem and now i have a nice pincushion. :( Any idea what I’m doing wrong? Julia – what measurements did you cut your front and backing fabrics? If you email me a pic, that would be great – I’d love to help! If i change this to Cm/metres will the measurements still work out the same? 1.5 Mtr and 1.25 mtrs? 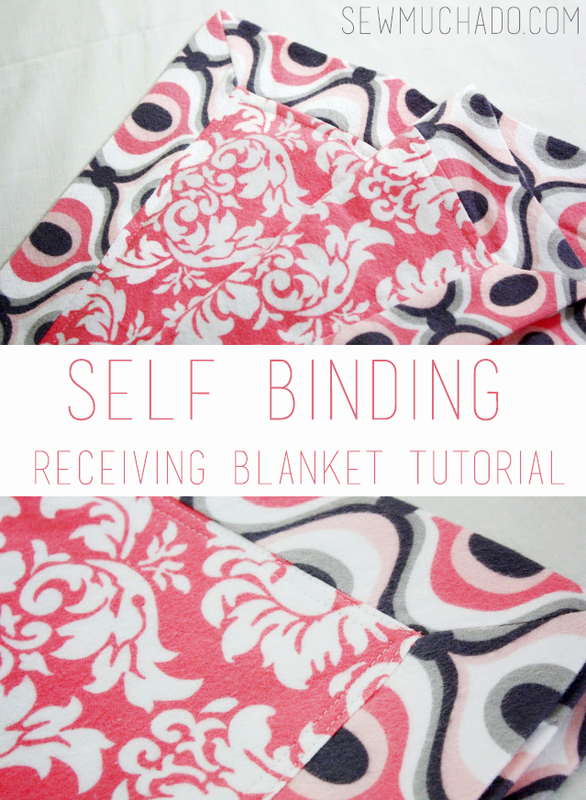 I also agree – this is one of the easiest tutorials to follow for self binding – well done! Just started on this lovely blanket, but I cut one corner the wrong way! 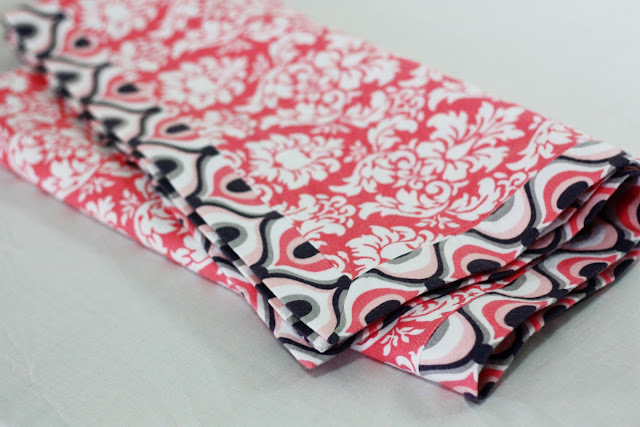 Now it is more like a fitted sheet instead of a border….. I think I know how to fix it but don’t want to make it worse! Thanks! Same thing as Julia. 40″ square or the front and 45″ square for the back. ??? I figured out what I did wrong, now to try and fix or rather, put in the new “enhancements” at the corners! Sharon – The only thing that needs to lay flat are the four sides. 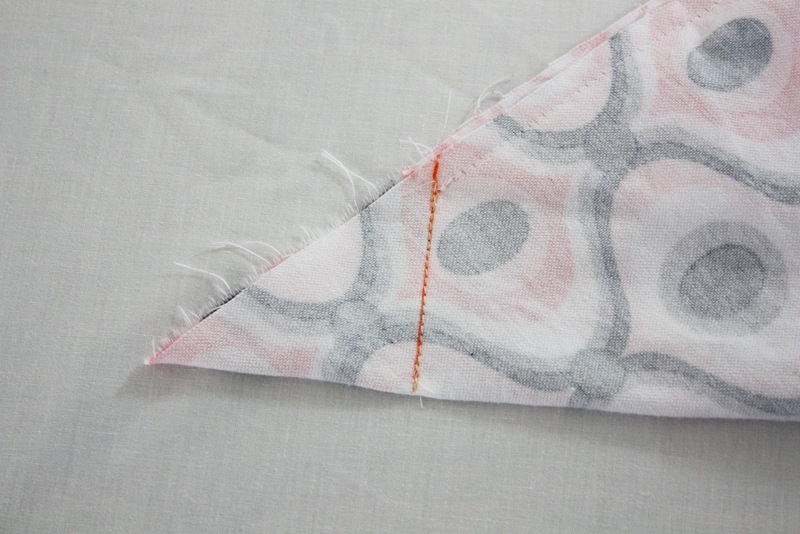 Each corner should have excess fabric (the one that you cut larger). If that’s not making sense, feel free to email me a pic and I can figure out exactly what you’re having trouble with :). Where did you buy this beautiful flannel fabric? Anon – I ordered it online from Fabric.com, and it’s by Michael Miller :). 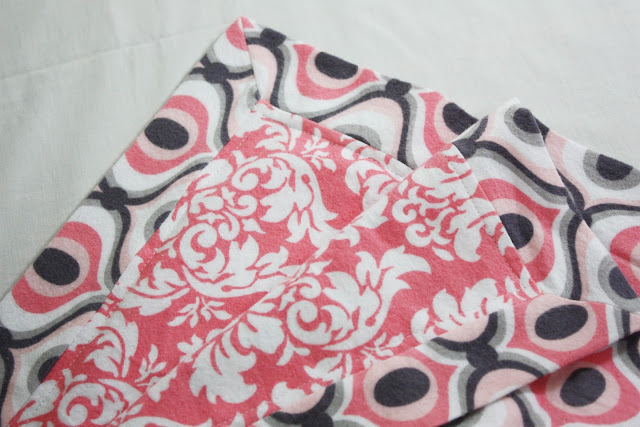 Can you make this blanket from a rectangular piece of fabric? 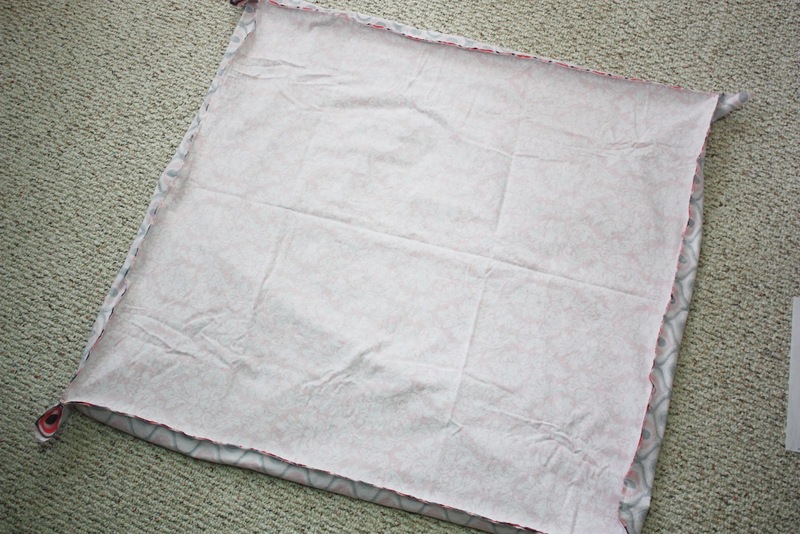 I used a 40″ square and a 30″ square and it was plenty big for a receiving blanket (that’s 1 1/8 yard and 7/8 yard). I also used a fancy stitch for the top stitch with a twin needle. How often do we ever use our fancy stitches? Turned out great! Love, love, love these little blankets. If you need a visual, there’s a youtube video if you google the self-binding baby quilt (receiving blanket) that’s 12.38 minutes long. I made 5 for my new granddaughter whom we are still waiting to be born, and another with Yo Gabba Gabba flannel for her sister who is 1. She loves Gabba. I will give her this as a gift for when her little sister is born. Anon – I’m guessing that your issue has to do with the way you mitered your corners. I’d go back and double check that your corners look just like the blanket in my photos, it’s easy to accidentally get the angle wrong :). What did I do wrong? I folded the fabric so the seams matched before marking the angle to sew so my blanket was a triangle when folded. My edge turned out to be about an inch wide. The corner angled seam is 1/2 on the front and 1/2 on the back. Anon – What sizes of fabric squares did you start with? The smaller the difference between the two, the smaller the border ends up being. Did you start with a smaller difference than I mentioned? I would also double check that your corners look exactly like the photographs before stitching. Sew Much Ado – I wish I were like you and could sew beautifully. I did cut my fabric 6 inches smaller but I’m fairly certain I cut 90 degrees instead of 45. I’m going to try this again. Once I sew it correctly I will be very happy with my creation. :) You are very helpful also. I got it! My husand helped me get the angle correct. Yeah! I’m so glad I kept at it. I made several of these blankets for a fundraiser for a friend who has just been diagnosed with cancer. They were a success. Thank you for this excellent tutorial! You are very talented! I did the same thing as Julia also. Is there anyway to fix it if you already cut the fabric at the wrong angle? Where was this a week ago?!?! I made my daughter a new silky because she lost hers (aka the world has come to an end) and I didn’t know the proper term to search for to figure out how to do this binding! I just gave it my best shot. Didn’t turn out horrible, but definatley going to bookmark this page for the future. From one instructor to another, this is an EXCELLENT tutorial! I found this project on Pinterest…thanks for sharing. You make it look so easy. I too got the angle wrong and of course I cut the fabric as instructed before turning right side out and realizing it was wrong. :( can anything be done to salvage this project, without cutting it apart and starting over, smaller? 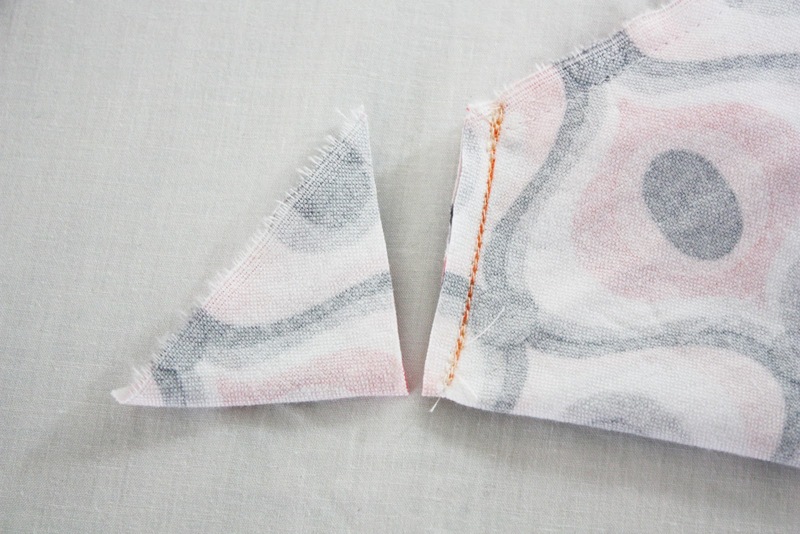 Anon – Since you already cut the backing fabric the wrong way, I don’t know that it’s salvageable as is (although maybe someone else knows otherwise and will have a better answer for you!). You could either do as you mentioned and remake the blanket smaller, or you could keep the front fabric and replace the backing fabric. That way you’d at least be able to still use the original front piece. Good luck! All — I fell into the trap, too, and now my backing fabric is cut wrong. Actually, I marked and stitched two of the four corners, and then got interrupted, and then completed the remaining two corners. Trimmed all, turned inside out, and realized it was wrong. I did measure each of my corners to the 45 degree angle but believe that the error lay in not matching the “proper” adjacent seamlines before marking and stitching….and cutting! I realize now that the marking and stitching lines on the two “bad” corners are longer than the stitching lines on the two good corners. So I’ve learned: don’t get distracted, match the “adjacent” seamlines correctly, and make sure all four stitching lines are the same length as each other, before trimming anything away! This is still a good project and I will try it again. Thanks! Bummer! Sewing is all about trial and error sometimes, isn’t it?! I know about that all too well :). Hope your next try goes better! Thanks for the great tutorial! 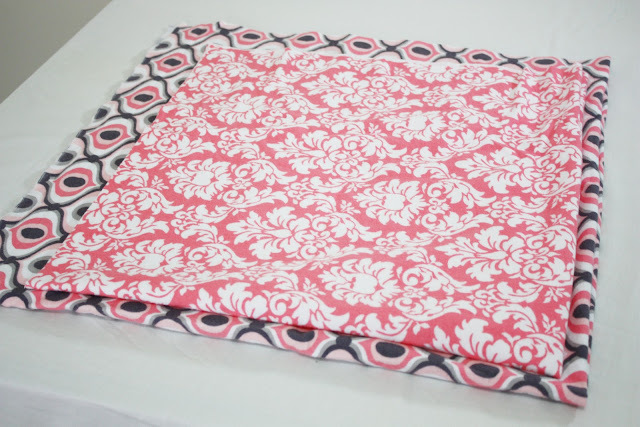 I did a blanket yesterday….finishing up this morning and then made a burp cloth to match using same technique! What a great way to use up my flannels and have some wonderful baby gifts in stock! Terrific tutorial!! 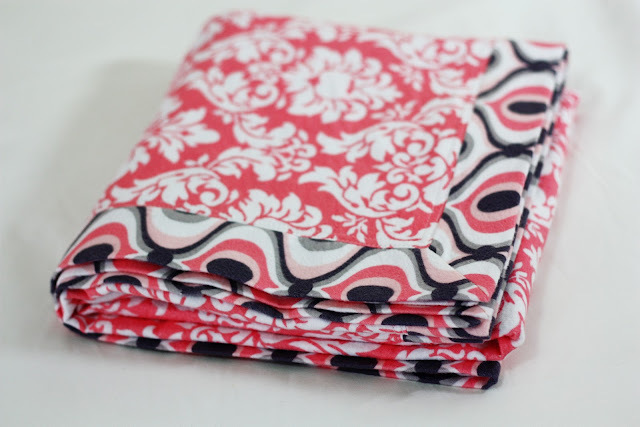 I saw a cute blanket like this in a store (with ric rack added for embellishment) and I wanted to duplicate it, but they forgot to include the pattern when I bought the fabric. I watched a few tutorials on youtube and read many online, but yours was the easiest to follow. Clear, concise and great pictures. I am thrilled with how it turned out. Thank you, thank you!! Mehnaz – No folding at all in step one, just remember that you’ll be left with excess of the backing fabric at each end :). Hi! I’m also confused about the “folding into quarters” and pinning the center of each edge instruction from step 1. Sorry if this is obvious and I’m missing something? Hi Natalie! Basically you are just finding the center of all four sides of each piece of fabric. You can fold the fabric in half, and then half again so that all halfway points can be marked at once, or you can fold each edge in half one at a time to find the center. It’s important to find the centers so that the smaller piece will end up being centered on the larger piece. Hope that helps! I have made abt 10 of these. Excellent instructions. After pressing, I used a decorative stitch just inside the binding to hold it all together. Be sure you are prewashing, really important with flannel. Congratulations on brilliant photography work. Those who don’t speak/read English well can follow these instructions with ease and to perfection, giving them a great gift of achievement. Thank you, too, for the extra sizing information. 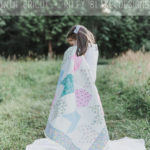 I love working with flannel (we call it flannelette here) but I’m wondering if using the softest of baby muslin, that very loose-weave stuff that is hard to work with usually because it won’t hold its shape, would work well as the inner blanket top in this project. Just a thought!! Thank-you for this! I was trying to make one of these from another tutorial, but couldn’t figure out the corners. It’s been sitting on my sewing table for months, but your tutorial allowed me to finish it in under an hour. Your blog is amazing! Yay, so glad to hear it worked out for you! And thanks! I saw the question asked but couldn’t see if there was a response. Just wanted to know if this technique can be applied on a rectangular blanket and if so what dimensions would be used? Thanks. If you make a rectangular blanket, you would just need to make sure that the backing fabric is the same amount larger than than the front fabric on each side (for example, 10″ larger in both width and length). Hope that helps! Thank you for this wonderful tutorial. These are so fun to make and give for baby gifts. Does anyone have comments about the middle of the blanket after its been washed? Would it be good to bind the two sides together? Hi. How did you sew the opening closed after pulling the blanket right side out? I just made one for a co-worker’s future son. I learned that if you don’t sew the corners PERFECT in the first steps, your blanket is a HOT MESS when you turn it right side out. Going to have to try another one one of these days and take the time to get corners right. Ah well, the little one has a wonky handmade blankey! Well this is the 3 one.i had my I pad right beside me when sewing.Yep looked like a mattress cover. Tru again tomarrow..ugh. I’m using 40 for back 30 for front. can this be done as a rectangular size instead of a square? Would it work the same way lining up middles? I have a question, when you are doing your binding is the batting already there? Hi Belinda! With this type of blanket, I don’t use batting – just two layers of flannel :). So glad to help, Janet! 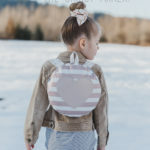 I felt so proud when I successfully made two of these for my daughter two years ago–and my husband was so impressed with how they turned out! I can’t wait to make more for my niece and second child now! Aw thank you so much! Congrats on your second child! Great tutorial! 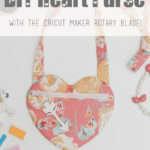 I am new to sewing and found this to be one of the most useful tutorials. I made about 8 of these blankets while I was pregnant. Thank you so much! Thanks for the tutorial! I made a blanket this morning following your instructions and it turned out perfect!! Hmm, that is a good question! I would probably just make a 21″ template out of cardboard if you are having trouble finding one to purchase – I don’t think I’ve seen one myself either! I found a 15 inch, so will make a 20 inch removals. Mine will be a bit smaller, but found another site where that is the site they used. My friend loved the one I made for her. Just have to get busy and get the other ones dine for the next mommy. This tutorial is great! I’ve made several of these blankets using another online tutorial and always find the mitered corner confusing. Your directions and pictures make the mitered corner a breeze. Thank you so much! I think this is an older post, but I wanted to thank you for your tutorial! It was one of the most clear set of instructions that I found — having both the written step by step instructions as well as the corresponding photos was a wonderful help. i had two cute receiving blankets, with perfectly mitred corners I might add, for my goddaughters baby shower today (along with bibs, burp pads, and a rag quilt)! I will be making a “stash” of these blankets to have ready for gift-giving. Thanks again!! On Christmas Eve my precious daughter-in-law was thrilled to open the package containing the self-bound receiving blanket I made for her first baby (our 7th grandchild!) who will arrive March 27, 2017! Your tutorial is awesome! I had watched several different You Tube videos but was hesitant about measuring and cutting the corners, as others have described. Thanks so much for explaining the process so well and for including the fantastic photos! P. S. Is there a way to insert continuous rick rack or other trim in the seam? I think that would add an attractive touch. Thanks again for sharing your wonderful sewing skills with us! How wonderful, thank you for sharing! You could definitely add some rick rack by just sandwiching it between the border and middle layers, that would be super cute!